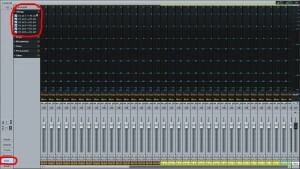 I know that most of you composers out there have already committed yourselves to your most favorite DAW software, and I know how hard it is to start from scratch on something new. To tell you the truth, it was the same for me as well. Here’s a true story: I accidentally came across PreSonus Studio One from a friend of mine who bought a PreSonus AudioBox and got Studio One bundled with it. 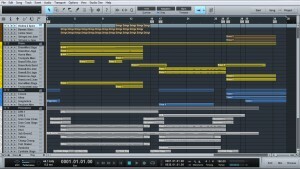 He uses a different DAW, so I took Studio One for a test drive—and boy oh boy, was I mind-blown. I got addicted from the moment I started using it. First of all Studio One LOOKS COOL! Second, it is totally easy to use even if you’re new to it. And last, but not least, every single track that you bounce from it sounds GREAT! Since I am a composer myself, I like to make my own default template for writing orchestral pieces or contemporary hybrid soundtracks. It’s very easy to do that if you’re using Studio One. 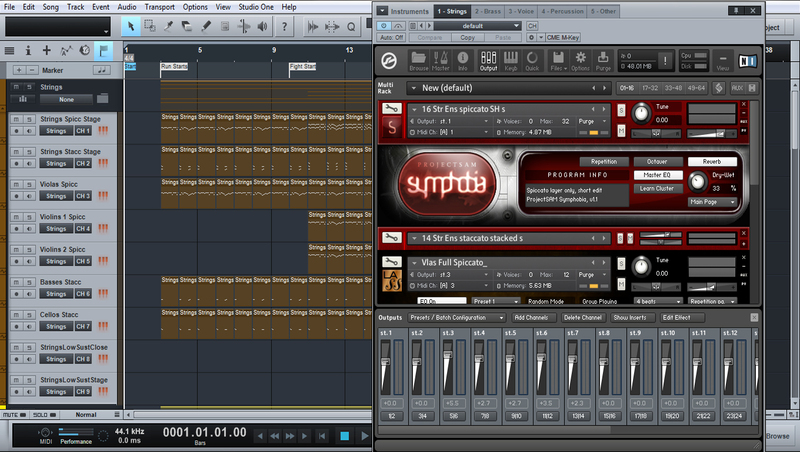 My default template for scoring consists of 6 instances of Native Instrument’s Kontakt that are loaded into Studio One. I have to point out that my PC is a bit older, so I can’t afford to load a bit more of virtual instruments because, believe it or not, I am using a 32bit Windows 7 based PC with 3.5GB of RAM and Intel Dual Core processor. My main orchestral library is Symphobia. I’ve chosen it because it covers everything that I need, and it sounds great. I am layering the string section of Symphobia with LA Scoring Strings, Symphobia’s brass with Orchestral Brass Classic and Symphobia’s Woodwinds section with EastWest Symphonic Orchestra Woodwinds. My percussions are mostly from True Strike library, and my choir is Requiem Light. I’ve marked the sections of the orchestra in different colors for easier orientation. Strings are brown, brass is yellow, woodwinds are green, choir & vocals are blue, percussions are white and those other instruments are red. 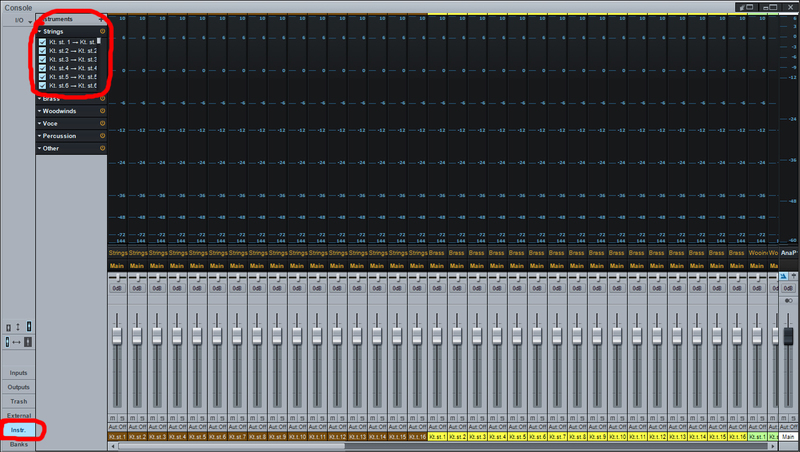 It’s easier to spot them when they’re in different colors if you are working with a big orchestral template. Of course, you can use your own color patterns as you see fit. 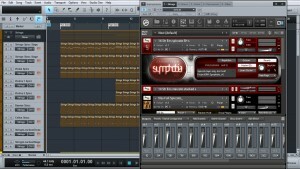 Studio One integrates with third-party VST instruments very easily. When you’ve created your desired number of tracks and sorted them out into folders, next thing that you should do is patch the instruments’ inputs into proper MIDI channels and route Kontakt patches into proper Kontakt outputs. For example: I’ve named my string section tracks as Strings 1 – 16, and I’ve assigned them to their proper MIDI channels 1-16 to match the channels of Kontakt. I’ve also named the Kontakt instance for string section as “Strings”, so I know that it’s only using string patches. Strings 1 are using MIDI channel 1 of Kontakt, and the patch output inside Kontakt is routed into channel output 1 of Kontakt, as you can see on the picture shown. And that goes for every channel of every section in every instance of Kontakt. Of course, I will rename the tracks properly when I have decided which articulations and which instrument from the section I am going to use for the project. And that varies from project to project. That is why I am naming the tracks as 1,2,3,4 etc. in each section. For example: String tracks are named “Strings 1”, “Strings 2”, etc. you get the point. Now the list of all of your loaded VST instruments will show. 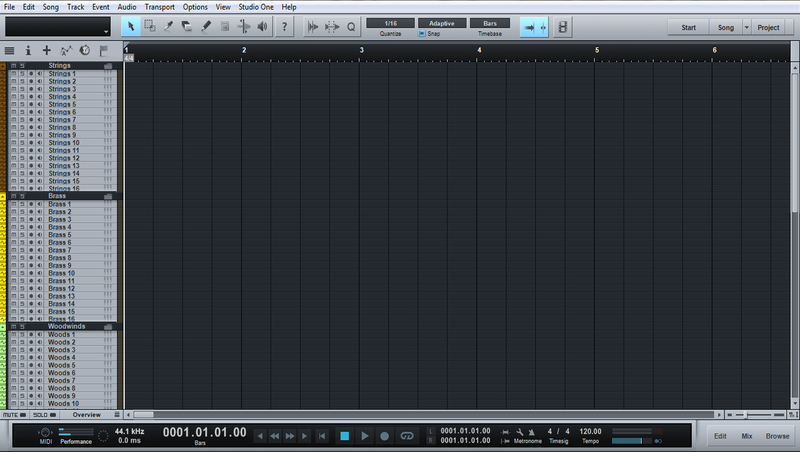 Click on the little arrow pointing down to the left of your first Kontakt and click “expand” on the drop-down menu. 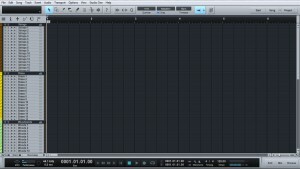 You have to check out all the channels of Kontakt that you want to use in order to be shown in the Console Window. Repeat the same process for other instances of Kontakt hosting other orchestra sections and you’re good to go. When you want to save your template, the only thing that you need to do is click File/Save As Template, and name that template as you see fit. Every time you start a new orchestral session, you can load your template from the menu that opens up when you’re creating a new song. That’s pretty much how I do it. So, to summarize it all: Create a new song and set up the options how you want it (my setup is on 48 kHz, 24 bit because that’s the standard sound setup when you’re writing music for video). Next you load a desired number of Kontakts that you want (or other samplers that you’re using), and create a desired number of instruments tracks for it. Sort out everything into folders and mark the tracks in different colors. Open the console view, select “instr.”, and check all the VST instrument outputs that you want to be active in the session. Finally, save the template and name it as you like. That’s it. Later on when you’re adding patches into Kontakt you will select the MIDI channel for the patch and assign the patch output to appropriate Kontakt output and rename the track in edit window. Next post: we will pan our virtual orchestra across the stereo image using an orchestra chart for reference and apply reverb—and get these VSTs sounding just like the real thing! did you specifically create stereo outputs. I ran across your issue last night and the tracks where created as mono at first. simple but I did oversee it…maybe you too. 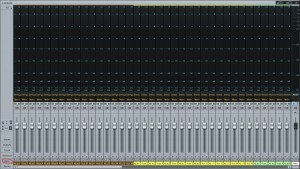 what I cant figure out – and maybe oyu have in the meantime – the above blog from Nikola shows 16 stereo outs in the mixer of Kontakt5 as well as 16 stereo tracks in S1. I can only create 8 stereo ones which is in line with what you are saying in your reply. if you figured it out by now, could you help out? …then the ultimate filmscore template is just around the corner….thanks to S1. Awsome read and so easy explained. Love the screenshots. Thanks sooo much for sharing. have been fiddling with this for ages already and will try it asap! Hey thank you for the blog.Loved it! Listen im 15 years old and i love to write music, especially symphonies. I am at a loss however in trying to find a decent choir, one that you hear in the climax of every epic movie. How did you get your choirs? Thanks so much for posting this blog! 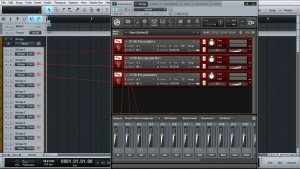 I’m a little confused about how the Kontakt outputs are routed to S1 channels. It appears in the images above that the Kontakt outputs are stereo and are routed to 16 S1 stereo channels. What I can’t figure out is Kontakt appears to have a maximum of 16 output channels total which would imply a maximum of 8 stereo outputs. 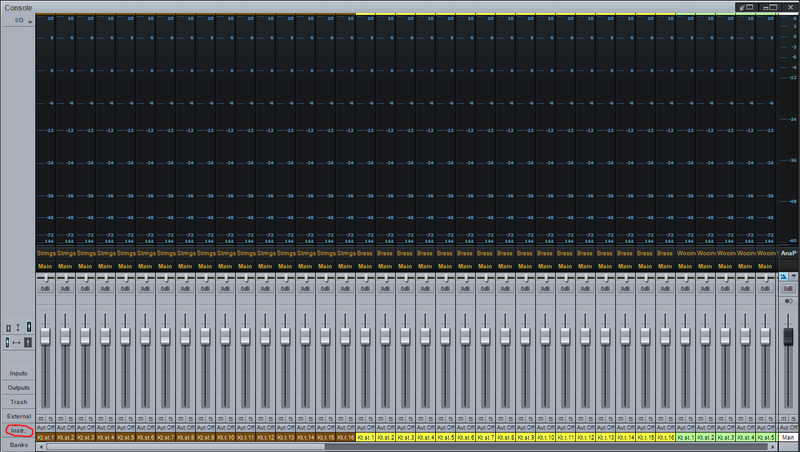 Furthermore, When I attempt this it seems that Kontakt exposes only 5 stereo outputs and 6 mono outputs to S1. Even I pair each set of outputs in Kontakt, S1 sees the last 6 Kontak outputs as seperate mono channels. I’m using Kontak 5 with S1 v2.5 (Windows 7 ). Am I doing something wrong?